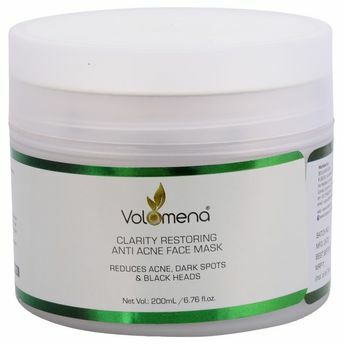 Volamena Clarity Restoring Anti Acne Mask has Organic Anti Acne Active system from the Amazon rainforest containing Balsam Copaiba Resin (and) Carapa Guaianensis Seed Oil (and) Euterpe Oleracea Fruit Oil which improves oily skin health, reduces the effect of acne, regulates the balance between moisturizing and oil production. This formula treats the pimples and controls the bacteria, and thus prevents redness, breakouts and skin irritation. It cures the damaged cells and conditions the skin. It retains skin moisture and improves general skin health. It nourishes and rejuvenates the skin, making it soft and smooth. Reduces Inflammation - It reduces inflammation due to acne-causing bacteria and prevents scar formation. It is very effective in erasing all the blemishes. Salicylic acid a beta hydroxyl acid works as a great exfoliator, it dissolves dead cells, close open pores and has Anti-inflammatory properties. Passion Fruit Oil moisturizes all types of skin and is great for acne-prone skin sensitive skin. Organic Tea tree Essential oil has an antimicrobial effect which heals acne and pimples. This pack helps you to flaunt flawless skin. It comprises of different ingredients which are blended to create an antibacterial formula. Name of Mfg / Importer / Brand: Kapco International Pvt. Ltd. Address of Mfg / Importer / Brand: Kapco International Pvt. Ltd. Plot No. 11Sector -3 Parwanoo. H.P.